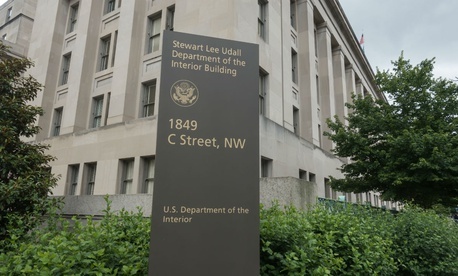 A supervisor at the Interior Department sent sexually explicit messages to three subordinate employees and “inappropriately” used department surveillance to capture images of employees without their knowledge, according to a new watchdog report. The Bureau of Land Management manager sent messages to one subordinate from a government computer during work hours, and to two other subordinates from his personal cell phone. All parties agreed the exchange was consensual, Interior’s inspector general said, but the manager acknowledged the conduct was not appropriate. The manager also admitted to using the building’s surveillance system, as well as his government-issued iPad, to “capture images of BLM employees without their knowledge.” The IG did not elaborate on the nature of the photographs. The same supervisor faced allegations of inappropriately using agency money to purchase a 72-inch television, but the IG could not substantiate that claim. Nancy DiPaolo, a spokeswoman for the IG, said the office as a practice does not make recommendations in investigative cases like this one. The office simply “present[s] facts,” DiPaolo said. The IG sent its findings to Brian Steed, BLM’s deputy director for policy and programs. The agency has about 60 days to respond. Interior Secretary Ryan Zinke has pledged to maintain a "zero tolerance" policy for sexual harassment, telling employees in a video last year that leadership would move quickly to hold employees accountable for "intolerable behavior." BLM did not immediately respond to a request for comment.